With projects like less than three, being kind to humankind and our Peace Day promotion…WHEW, we needed a little break. We decided to kick back and coast through the last part of 2013 to get inspired for upcoming tales of the village, but more importantly–the villagers. So, enjoy the holidays, and remember to savor all the moments of the season. You will never experience this time again. Get your oars in the water and glide along the coastline of your life–giving yourself the gift of time–to fully engage and connect to the wonder of this magical time of year. To the WordPress family…we appreciate you all. Thankyou for sharing your joys, heartfelt moments, frustrations, anger, art, addictions, photos, phobias, humor, misery, everyday life, sins, “aha” moments, anything and everything. We have enjoyed viewing and reading the plethora of talent and creativity that is out there. Happy Holidays from binvested, Karen and Terrie, reminding you that there is so much love out there for all of us. We just need to slow down and attune to life’s blessings. 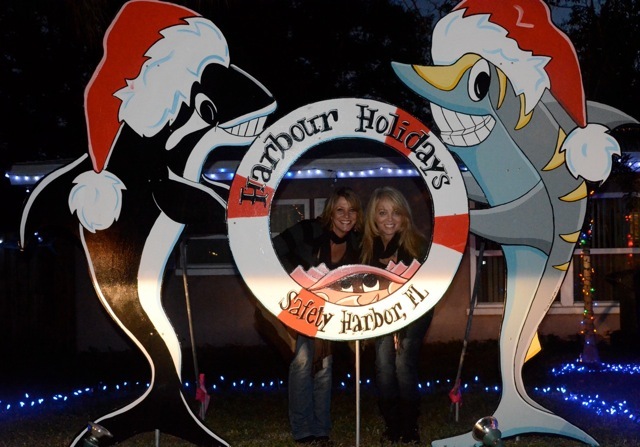 Thankyou John and Stacy Roth for letting us use your lawn decorations for this post. You two are such a lovely couple that give so much of your time to making this community, the village that it is. We love you! Thanks to Fairl Thomas for taking our pic…we love you too!!! AND…what about 2014??? We’re goin’ full throttle! Happy Holidays from the village.